Quakerism had its origins in the northwest of England in the mid seventeenth century. William Edmunson established a meeting in Lurgan as early as 1654. 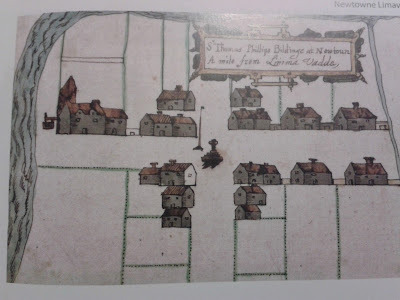 Quaker meeting houses in the Bann Valley area that were formed in the mid to late seventeenth century and included Toberhead, Dunglady and Coleraine in county Derry and in Co Antrim - Ballynacree (on the Vow road near Ballymoney), Lower Grange near Portglenone and Antrim town. Ideally weekly meetings were to be held in each of these regional locations (often in a local home) and then representatives were to be sent to the monthly meeting held in Antrim, which was the regional hub for Quakerism in the area. 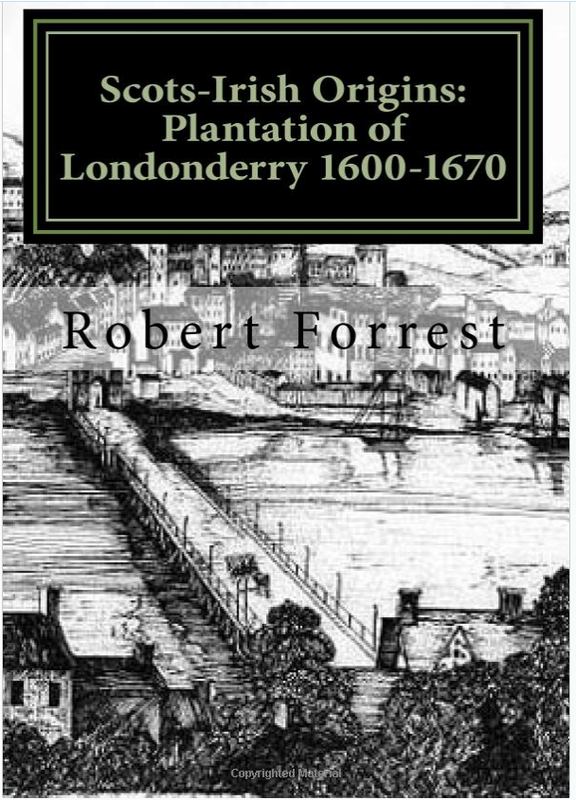 All of the local Quaker meetings struggled to survive in the region because Presbyterianism had become strongly embedded in the Bann valley from the Ulster Plantation. Most of these regional outposts struggled on throughout the eighteenth century but diminishing numbers caused by an outflow of emigrants and local decay saw the closure of most by the year 1800. Antrim alone has had a continuous and unbroken Quaker presence in the region. 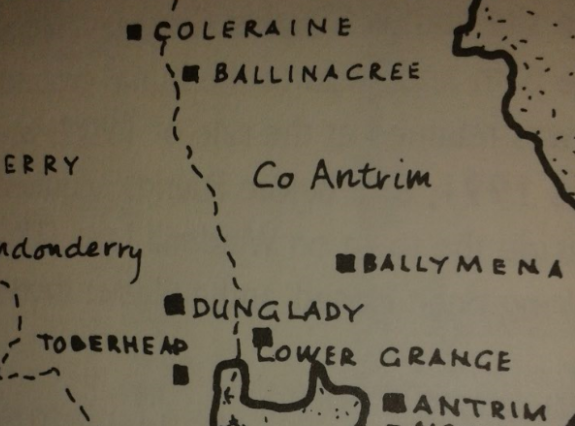 Antrim was the central meeting place - the other houses were regional outposts where members in those areas occasionally met. Meetings were held at (Lower) Grange, Ballynacree, Toberhead, Coleraine and Antrim. 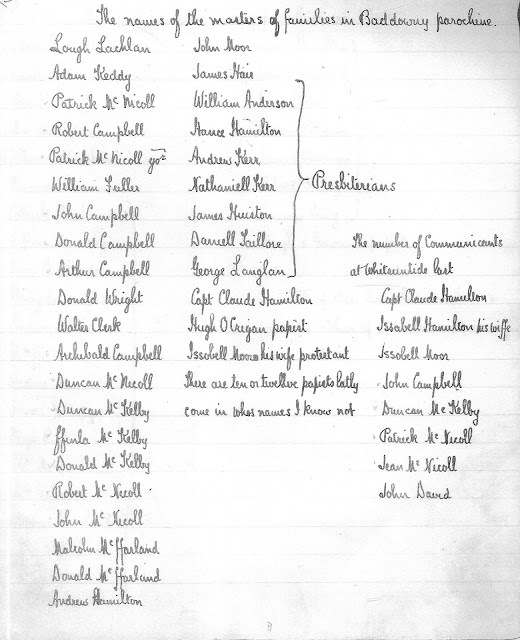 There was also a Quaker presence in Dunglady but no meeting house appears to have been built there and they were so closely connected to Toberhead to be considered one meeting place. 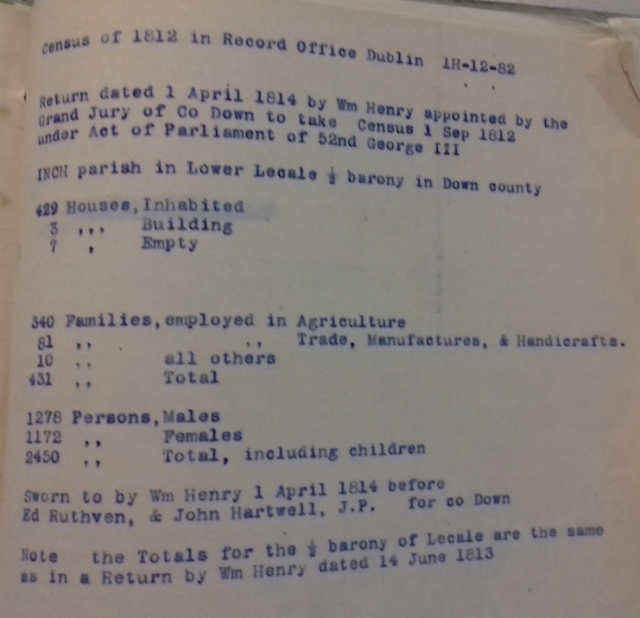 Early records for the Quakers in the regional outposts are to be found in the monthly minutes of the Antrim meeting. In addition the Ulster Quarterly meeting minutes occasionally give additional information on the progress of Quakerism in the area. 12 Oct. 1798-9 May 1801 Men's minutes (rough). 11 June-12 Nov. 1801 Men's minutes (rough). 1741-1800 Volume containing testimonies of disownment, letters of condemnation, certificates of removal, 1758-1800, marriages, 1768-77, births, 1751-1800, and deaths, 1741-97, and details about the discontinuance of Toberhead meeting, 1796. The earliest Quaker house was Toberhead, Maghera in the home of Archibald Scott 1655-60. Also a meting was held at (Lower) Grange near Toomebridge at the same time. A meeting was organised in Antrim town in 1669 and this was followed by Coleraine and Ballynacree [Ballymoney] in 1673. 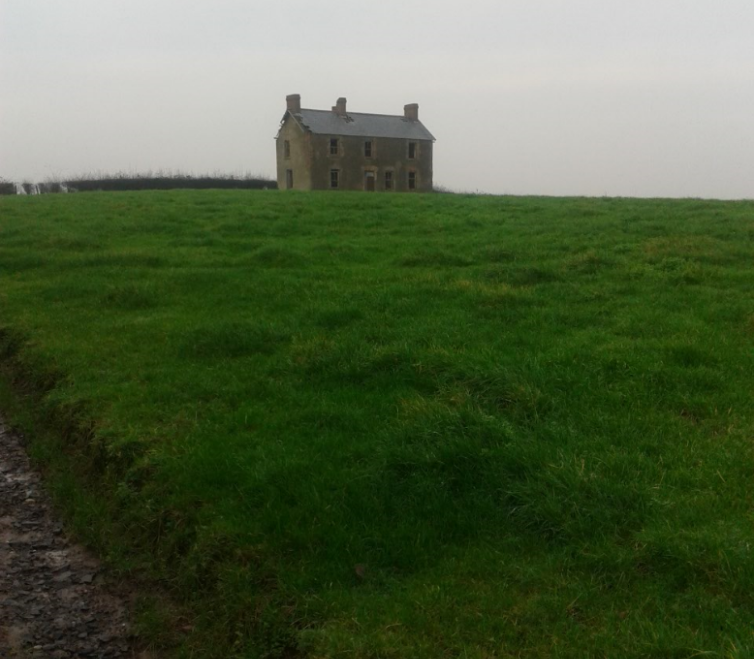 In 1692 a meeting was formed in Dunlady [Dunclaudy & variant spellings] in the home of William Henderson near Swatragh in Derry. In 1738 'Downglady' became part of Toberhead. By 1799 Toberhead ceased to exist as a meeting place for Quakers. The Toberhead meeting was held occasionally in the home of the McCools and also the Greggs also committed Quakers in the area. The Moore family were strongly connected with Ballynacree. In the sixth month, 1698, I traveled into the North. Next day to the quarterly meeting near Ballinderry, which continued part of three days, for the worship of God and church affairs. When the service of the meeting was over, we went to Lurgan meeting, and their to Ballyhagan meeting, and so to the meeting beyond Charlemount, and Toberhead meeting near Salter's Town, where many Friends met us, also many other people came, and a heavenly meeting it was. Then we went to Grange; there to Colerain, and so to Dunclaudy meeting; in all which meetings with Friends, the mighty power of the Lord did accompany us in his word and testimony, to the comfort and confirmation of faithful Friends and placing of judgment on the unfaithful. Now having so far gone through Friends' meetings we entered on the mountains in the county of Londonderry, and had a meeting at Dungivin on a first day, to which came many people, several persons of account; and all seemed to be well satisfied with what was declared in the authority of the Lord's Spirit and power, which reached his witness in their hearts. 27th of the sixth month, 1700. After this meeting we rode to John Whiteside's near Charlemount, fifteen miles, and the next day had a heavenly meeting with Friends at their meeting-house, and on the day following went to Toberhead twenty miles; the next day, being first day of the week, we had a meeting with Friends at Thomas Gregg's house, many Friends met us there, from Grange and Dunclaudy; then we went to Colerain, and had a meeting there, and several Friends came out of the country to it; from there we rode to Grange, and had a meeting there with Friends, and another at Antrim. Myers mentions in his book that he visited Ballymoney in the year 1900 looking for evidence of where the Ballynacree meeting had been held but the knowledge had passed out of local folklore. Someone was able to tell him the of the Quaker burial ground for Ballynacree which he found out was at 'Lamb's Fold at Enogh near O'Hara's Brook about 2 miles west of Ballymoney'. Broagh burial ground is on the summit of of the hill fort known as Hamilton's fort. The first Quaker use for the internment was George Gregg although it was used by others as well as members of the Toberhead meeting. It is one and a half miles south west of where the Toberhead meeting house was built in 1777.